This guide provides instructions for installing the Fabric8 Launcher tool on a Single-node OpenShift Cluster. This guide walks you through the process of installing the Fabric8 Launcher tool to run on a local cloud as provisioned by a Single-node OpenShift Cluster. This includes Minishift, an all-in-one VM with OKD, or Red Hat Container Development Kit, a VM that includes OpenShift Container Platform. choosing how you want to build and execute the mission. The Fabric8 Launcher tool uses your choices to generate a custom project, called a booster, and either launches it directly to the same OpenShift instance, or provides a downloadable ZIP version of the project. To use the Fabric8 Launcher tool on a local cloud, you must have a Single-node OpenShift Cluster installed and configured. You can use either Minishift or Red Hat Container Development Kit. The installation steps for Minishift are available in the OpenShift documentation. The installation steps for Red Hat Container Development Kit are available in the Red Hat Container Development Kit Installation Guide. The steps for installing Single-node OpenShift Cluster vary by platform. You must have the oc binary installed and it must match the version of the Single-node OpenShift Cluster you are using. This chapter contains instructions for starting the Single-node OpenShift Cluster and configuring it to execute the Fabric8 Launcher tool. Starting your Single-node OpenShift Cluster can trigger a download of large virtual machines or Linux container images. This can take a long time. Subsequent startups are expected to be shorter as long as the virtual machines and Linux container images remain cached. Because a Single-node OpenShift Cluster is intended for development purposes, it uses HTTPS for the web console and only provides a self-signed certificate. If your browser prevents you from accessing the page due to an SSL error, you must allow your browser to bypass SSL security policies for the Single-node OpenShift Cluster URL to use it. The screenshot below shows the warning message in the Google Chrome browser. Depending on your operating system, virtual machine driver, and the number of boosters you run, the memory allocated Single-node OpenShift Cluster can be insufficient. In this case, increase the memory allocation. Depending on your system configuration, it is possible that you must manually specify an alternative virtual machine driver. You must have virtual machine software, such as VirtualBox, installed before you specify it. On macOS, the default virtual machine driver, xhyve, can be unreliable. If you experience issues, specifying VirtualBox is a reliable alternative. Open the Single-node OpenShift Cluster Web console. Alternatively, use the URL provided in the log information. Log in using the developer username and an arbitrary password. 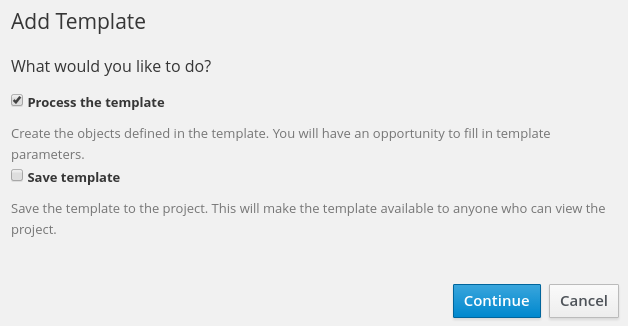 Next to the project name, click the three-dot menu icon. To install the Fabric8 Launcher tool on a Single-node OpenShift Cluster, you must provide the Fabric8 Launcher tool with a GitHub personal access token. This enables the Fabric8 Launcher tool to create booster applications and save them as Git repositories in your GitHub namespace. Using a web browser, navigate to https://github.com/settings/tokens. Add a token description, for example Fabric8 Launcher tool on a Single-node OpenShift Cluster. Save the hex code of the personal access token. You need this to complete the installation of the Fabric8 Launcher tool on your Single-node OpenShift Cluster. This hex code is displayed only once and cannot be retrieved after you leave the page. If you lose the code, you will need to create a new personal access token to install the Fabric8 Launcher tool on a Single-node OpenShift Cluster again. Install a local customized instance of the Fabric8 Launcher tool, which allows you to test the functionality or make modifications to the service using a web interface. Add-ons enable you to extend the behavior of Single-node OpenShift Cluster, and the Fabric8 Launcher tool provides an add-on as an installation option. A GitHub personal access token. Download and install the Fabric8 Launcher add-on. Installing the add-on creates a new project called rhoarpad where the Fabric8 Launcher tool runs. Monitor the status of the Fabric8 Launcher tool until it completes start up. Obtain the route of your Fabric8 Launcher tool. Navigate to your Fabric8 Launcher tool and start using your Fabric8 Launcher tool to launch booster applications. This is the same service as https://developers.redhat.com/launch but running in a Single-node OpenShift Cluster. See the Getting Started with Red Hat OpenShift Application Runtimes for a walk-through of running a booster application. Single-node OpenShift Cluster installed and running. Open the Single-node OpenShift Cluster Web console and log in. Click New Project to create a new OpenShift project to house the Fabric8 Launcher tool. Name the project and optionally provide a description. 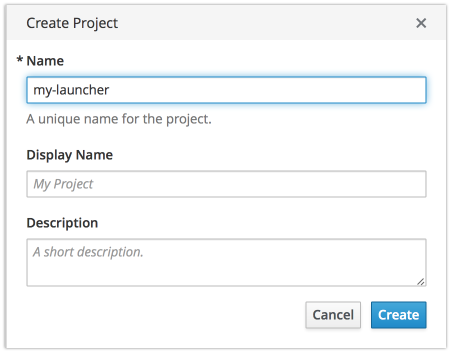 This example uses my-launcher for the project’s name. Click Create to complete the project creation. 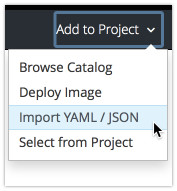 Click Import YAML/JSON to add services to your new project from a template. Copy the contents of the current Fabric8 Launcher template from the GitHub repository and paste it into the text box provided. Click Create, ensure that only the Process the template option is selected, and click Continue. Your GitHub Mission Control access token is your personal access token for GitHub. The Target OpenShift Console URL is the OpenShift Console URL from your Single-node OpenShift Cluster. This should be the same base URL you are currently using to complete the form, for example https://192.168.42.152:8443. OpenShift username and password from your Single-node OpenShift Cluster, for example developer for the username and password. KeyCloak URL and KeyCloak Realm MUST be cleared out. You must clear these fields out for the Fabric8 Launcher tool on your Single-node OpenShift Cluster to be configured correctly. Do not modify Catalog Git Repository and Catalog Git Reference unless you are developing against a specific catalog repository. Before proceeding to the next steps, confirm all the fields are correct. Also confirm that KeyCloak URL and KeyCloak Realm have been cleared out. Click Create to complete the setup. You will see a screen confirming that the service has been created. Click Continue to overview. On the overview page, wait and confirm that the four pods for the Fabric8 Launcher tool have completed starting up. When all pods are running, click the link at the top of all pods, which typically ends in nip.io. A new browser tab opens with the Fabric8 Launcher tool. This is the same service as https://developers.redhat.com/launch but running in a Single-node OpenShift Cluster. Start using your Fabric8 Launcher tool to launch booster applications. While developing your cloud-native applications with Java and Maven, you may be required to build them repeatedly. You can deploy a Nexus Repository server alongside the Fabric8 Launcher tool on your Single-node OpenShift Cluster and use it to fetch artifacts from the Maven Central repository and cache them locally. This reduces the network load when building your application, and helps accelerate the build and rolling updates. Your Single-node OpenShift Cluster set up. Follow the instructions in Install and Configure the Fabric8 Launcher Tool. Your Single-node OpenShift Cluster configured to use at least 4096 MiB of RAM and use the required oc CLI tool version. The procedure described below works with Minishift. It has not been tested for use with CDK. The Fabric8 Launcher tool deployed to your Single-node OpenShift Cluster. A booster application deployed to your Single-node OpenShift Cluster. Log in to your Single-node OpenShift Cluster instance. You can reuse the Docker daemon instance used by Single-node OpenShift Cluster to download the latest versions of the Nexus Docker container image. Create a new project to contain the Nexus server. You can also use the New Project button on the Web console to do this. Deploy the Nexus container image. Expose the service route URL of the Nexus server. Attach a persistent volume claim with a minimum size of 10 GiB to the pod running your Nexus application. Navigate to the project containing your booster application. Define and start a new build. Ensure that the YAML template of the builder image you are using for your application has the MAVEN_MIRROR_URL environment variable defined. If it does not, see the Nexus documentation for instructions on configuring your build manually before proceeding. Nexus comes pre-configured for the Maven Central repository, but you may need other repositories for your application. To access images provided by Red Hat, add the Red Hat JBoss Middleware Early Access Maven Repository to your Nexus instance. Navigate to http://nexus-NEXUS_PROJECT_NAME.LOCAL_OPENSHIFT_HOSTNAME/nexus/content/groups/public to view the list of artifacts stored in your local repository. If your build uses Nexus to retrieve artifacts, the build log output should reference the path http://nexus.NEXUS_PROJECT_NAME:8081/.